If you've been following me for a while, you know that my style most definitely would not be described as "girly." With an aversion to anything pink and frilly, and a need to constantly incorporate black into every look (I swear, I'm trying to overcome this), I definitely veer towards a more edgy, classic style. So, when summer rolls around and floral dresses are in every major store, I sometimes struggle to make summer looks my own. 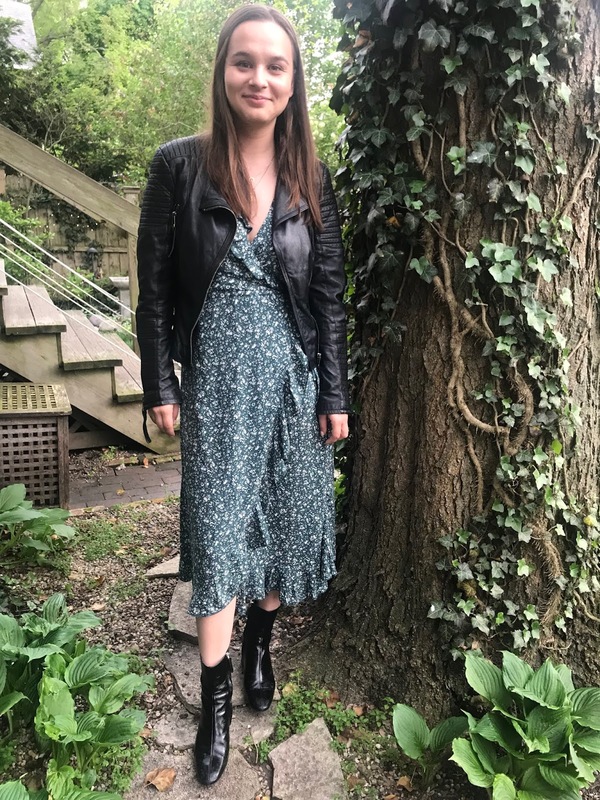 I honestly really like floral dresses – I think they are easy to throw on and typically come in nice silhouettes (especially wrap dresses which are my favorite). But sometimes, they don't feel like me, as cliche as that sounds. To really make this hot summer trend my own, I love to throw on a pair of black booties, particularly my patent leather ones. I'm hoping to get Doc Martens soon which I really love with girly dresses, as well as throughout the winter. I not only like that this gives me more height, but immediately changes the look from girly to slightly edgier. With a pair of brown sandals, this dress looks completely different – shoes make a huge difference! Since it was slightly chillier this past weekend, I added my favorite black leather jacket which helps tie my black shoes in a bit more seamlessly. It's these kinds of super easy and quick changes that you can really show your style and make something that you typically wouldn't wear your own. The key to this is really investing in a few key pieces. Get a great pair of black booties, a good leather jacket, and some cool accessories that you can mix and match for each look. It's things like boots and leather jackets that I like to splurge on because you can wear them with anything and everything. Once you have those go-to pieces, every outfit will pull together seamlessly. Hope you're all having a great week! Check back tomorrow for my top eight things I've purchased this month!